Supplier’s credit service is a trade credit facility for imports into India, where a Buyer (importer) is able to avail credit either from the Seller or from a financial institution, preferably from Seller’s country. This is only made available under Letter of Credit (LC) and not accepted for any other import payment methods. Get instant quotes for supplier’s credit with SaveDesk at the lowest interest rates for the import of raw materials, capital goods, and non-capital goods. 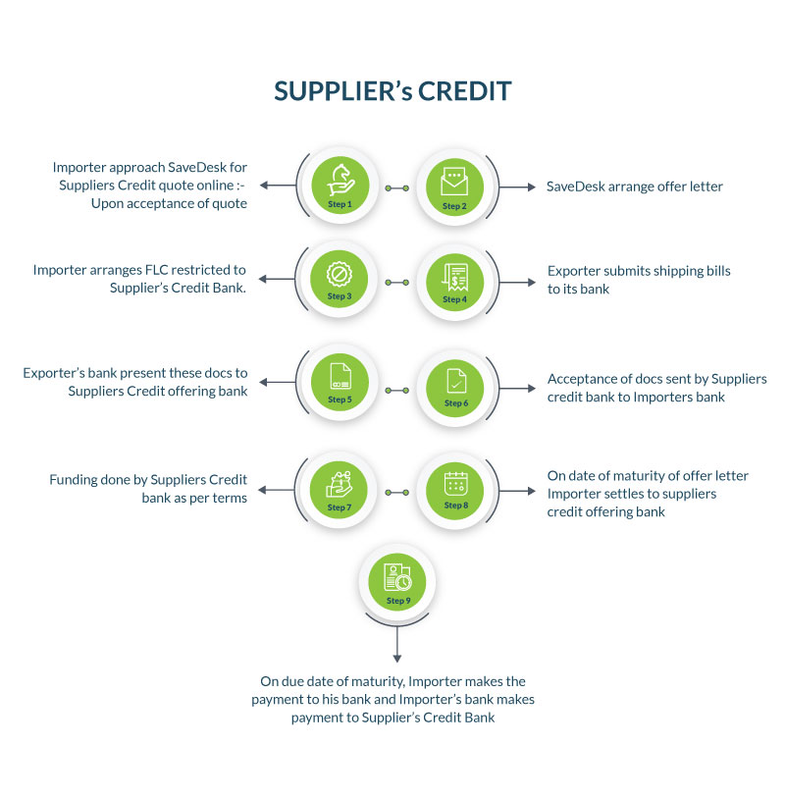 Supplier’s credit is a trade credit facility for imports into India, where a Buyer (importer) is able to avail credit either from the Seller or from a financial institution, preferably from Seller’s country. This is only made available under Letter of Credit (LC) and not accepted for any other import payment methods. SaveDesk gets an offer from overseas financial institutions. Buyer confirms on the pricing offered and gets the LC issued through his working capital banker. LC’s are generally restricted to overseas FI’s counters . Upon shipment, Supplier submits the documents to their bank, which in turn is sent to overseas FI from whom Supplier’s credit is being availed for scrutiny of documents. This is further forwarded to buyer’s bank by overseas FI for acceptance. Upon acceptance by Buyer, buyer’s bank sends overseas FI guaranteeing payment on due date. Overseas FI discounts the bill and makes the payment to supplier through their bank. On due date, Importer makes the payment to his bank, which in turn is paid to overseas FI to settle the transaction. Can an Importer avail Supplier’s credit for open account or DA/DP bill payment term? No,Supplier’s credit can be availed only for imports backed by LC. What’s the maximum tenure Supplier’s credit can be availed for? 1 year for Non-capital goods & 3 years for Capital goods from the date of shipment. What is the maximum amount for which Supplier’s credit can be availed? Under automatic route, USD20 Mn equivalent trade credit can be availed per import. Beyond the prescribed limit, all the transactions are referred by RBI. What are the costs associated in availing Supplier’s credit? Are there any changes in the LC being opened while availing Supplier’s credit? Yes, there are a few changes in the LC that needs to be done before issuance. SaveDesk advisor will help you suggest those changes that are required before availing. Can I avail Supplier’s credit for LC that has been issued already? Yes,it can be availed on account to some amendments on LC relating to restrictions clause & payment terms. Can I rollover my Supplier’s credit? Rollover is permitted to the extent of permissible tenure depending on the type of import(capital/non-Capital). Non-Capital imports are restricted to your working capital cycle.